In September 2012, the Department expanded areas where hunters must observe special rules pertaining to the handling and transportation of big-game carcasses to all of Game Management Units 19, 28 and 34. Simple Precautions Advised: Public health officials advise hunters to take the following precautions when pursuing or handling deer and elk in the endemic area. 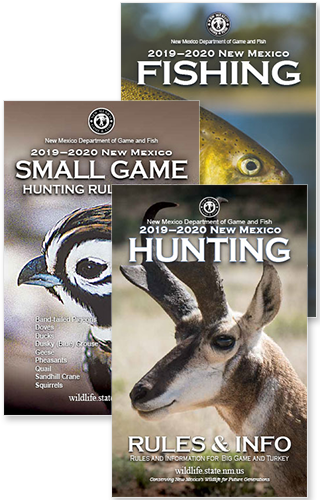 Do not shoot, handle or consume any animal that appears sick; contact the New Mexico Department of Game and Fish at (505) 476-8038 if you see or harvest an animal that appears sick. Bone out the meat from your animal. Request that your animal is processed individually, without meat from other animals being added to meat from your animal. Hunters are advised not to eat certain parts of deer and elk. While the agent that produces chronic wasting disease in deer and elk has not been positively identified, there is strong evidence to suggest that abnormally shaped proteins, called prions, are responsible. Research completed by the Division of Wildlife and other agencies indicates that the prions accumulate only in certain parts of infected animals – the brain, eyes, spinal cord, lymph nodes, tonsils and spleen. Research also indicates that prions do not accumulate in muscle tissue. Based upon these findings, hunters are recommended to bone out their meat and consume only muscle tissue from animals harvested in endemic units. Close Up: Biopsy of deer tonsil. Discussion of Chronic Wasting Disease (CWD) began among Department personnel in the early 1990’s. At the time, deer at Brazos were numerous and concentrated, and reports of deer in very poor condition were common. After a deer began sleeping on the doormat at the front door of a home, the Department collected the deer and submitted the first suspected CWD case. The test came back negative from Veterinary Diagnostic Services in Albuquerque. CWD was found only in Colorado and Wyoming and seemed to be a remote risk even after the disease was detected in Nebraska. When CWD was detected in Wisconsin in early 2002, the risk of spread became real and proximate. New Mexico followed Wisconsin with CWD detected in a White Sands deer during March of 2002. A CWD advisory board was convened from several agencies. Surveillance was planned for the area of the index case. Department personnel, with strong public support, opposed any attempts to depopulate the mule deer in the area of the index case to eliminate or reduce prevalence of CWD. The first CWD symposium was convened in Denver, CO during in August of 2002. At that meeting, a group met to assist New Mexico with surveillance. In December, persons from National Park Service and Colorado Veterinary Diagnostic Laboratory came to New Mexico to capture deer at the White Sands cantonment area. High winds hampered capture with clover traps, and chemical immobilization was difficult. Of 5 deer killed or captured, 3 were positive with CWD. 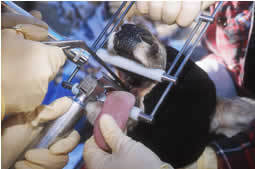 This operation was the first application of ante-mortem testing with tonsillar tissue for management purposes. The Department instituted mandatory check-in and check-out of hunters in Game Management Unit (GMU) 19 for the following hunting season in January 2003. 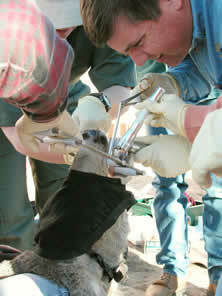 It was also mandatory during that hunt for hunters to present all harvested deer for tissue collection and CWD testing. Two hunter-killed deer from Dripping Springs and the adjacent Organ Mountains yielded positive tests. Since then, check-in and check-out of hunters in GMU 19 and presentation of harvested deer for CWD testing have remained mandatory. No more hunter-harvested deer from GMU 19 have tested positive for CWD since that time. Additional positive deer have been collected from GMU 19, but they have been reported suspect animals or deer captured through surveillance. To date, the cumulative total of CWD detections in GMU 19 is 19. Early in 2005, a sick, lethargic, emaciated deer was reported in Timberon, NM, GMU 34. That deer was collected and CWD was confirmed. This was the first case of CWD in GMU 34. During the hunting season of 2005, the first elk with CWD were tested. One was a reported CWD suspect, and the other was a sport-harvested elk; both were free-ranging animals. To date, the cumulative total of positive CWD tests from GMU 34 is 13, 8 deer and 5 elk. During the 2007 hunt, a youth hunter harvested a buck deer appearing normal from GMU 28. The positive CWD test was the first case confirmed in GMU 28. It is now mandatory for GMU 28 hunters to present their harvested deer and elk so tissues can be collected for testing. Personnel from Fort Bliss collect tissue from harvested deer during the hunt, and now CWD positive deer are harvested each year. Prevalence seems higher in GMU28 than any other area, and the Department has done more ante-mortem surveillance in GMU 28 than any other unit. To date, the cumulative number of positive CWD tests is 26, and of those, 4 were harvested elk. CWD has not been detected in species other than deer and elk in New Mexico. Tissues from bighorn, antelope, oryx, and cougar have been tested. Other states have also done surveillance in other species, but in the United States, CWD has not been detected in any species outside the family, Cervidae. From the beginning, the Department has encouraged successful hunters to present heads of harvested deer and elk for CWD testing. The Department submits tissues for CWD testing at no cost to hunters. Hunters who participate are entered into a random draw for hunting license authorizations. This has served as an incentive for hunters to present their harvested deer or elk heads for testing to increase the extent of surveillance. In 2003, over 800 tissues were tested. Currently, the Department receives 200-300 tissues annually for testing. Most of these tissues are collected at established collection sites. Each year, collection sites are established in GMU 34 and GMU 28. GMU 19 hunters contact the Department by phone for tissue collection. Fewer than 100 hunters present their harvested deer or elk heads at a Department office, though each office is prepared to collect tissues from hunters. The Department conducts targeted surveillance through capture and ante-mortem testing at herds deemed to be at high risk. The Department has also done advance ante-mortem testing in populations from which deer were subsequently translocated. All deer or elk found or reported to be sick or abnormal are collected and tested irrespective of clinical symptoms. Surveillance among abnormal animals is among the most effective methods to detect presence of CWD. Game parks in New Mexico increase risk for CWD because translocation of animals is central to the business. Most game parks in New Mexico are dedicated to hunting. These are high-fenced areas, and management of the animals inside is negligible. A very few game parks support managed breeding for production and sale of live animals. Animals in production facilities are closely confined at high densities and fed rationed feed. If infected, CWD spreads rapidly under such conditions. Class A Park rules do not mandate surveillance testing in the absence of confirmed CWD. None of the game parks elects to test any of their cervids. Rules to import cervids into New Mexico game parks are thorough, and, if followed, reduce risk of bringing CWD into game parks. The Department is certified by USDA to administer the federal Herd Certification Program. Because game parks are isolated and not closely monitored, compliance with importation rules is unknown. No restrictions exist to hinder or regulate intrastate movement and trade among game parks within New Mexico. Natural reproduction occurs within hunting game parks, but is unmanaged. The Department has conducted depopulation of 4 game parks since 2002. Tissues were collected during depopulations, and no positive tests resulted. The Department has quarantine authority and has exercised it once for a case in which a New Mexico game park became a trace forward facility in an epidemiological investigation from Colorado. This quarantine lasted until 5 years from the time of the importation at issue. The Director of the Department has authority to declare an animal health emergency and suspend existing rules or implement special measures. A moratorium on importation was declared in the early 2000’s, as CWD was being detected in many new states. Currently, CWD appears to be spreading largely through human-mediated movements of cervids, and in January 2018, the Director of the Department declared a moratorium on importation for an indefinite duration. That moratorium remains in effect at the time of this writing. The Department established rules to prevent spread of CWD through carcass transport shortly after the first confirmed case. In CWD positive areas, hunters must leave high-risk material in the game management unit of harvest. Hunters may remove only boned meat, hide, antlers, cleaned skull caps, and teeth. The remainder of the carcass must be left in in the field. All deer and elk reported to be abnormal are now investigated. Those animals found by Department personnel to be significantly abnormal or compromised are collected. All such animals are defined as CWD suspects, and personnel collect the proper tissues for CWD testing. When possible and appropriate, full necropsies are performed in addition to CWD testing. This protocol allows the Department to understand some causes of unexplained mortality. This policy has resulted in a number of detections of CWD positive animals. The Department encourages hunters to present the heads of recent legally harvested deer and elk for CWD testing. Incentives for hunters are offered by the Department to increase surveillance through hunter harvest. This has been the best way for the Department to conduct tests from animals in all parts of the state. Some evidence exists that among deer, males might be more likely to get CWD. Buck-only hunting in New Mexico might be a factor helping keep the prevalence of CWD as low as possible. Special rules that facilitate maximum harvest in areas of high deer density also might help reduce CWD prevalence by reducing deer density. Such rules have been implemented in parts of New Mexico. Regulations to reduce risk of transporting CWD into New Mexico have been implemented and modified. Two complete importation moratoriums have been imposed by the Department. During times importation is allowed, source herds must document and verify their testing and inventory tracking. Since the U.S. Department of Agriculture implemented its Herd Certification Program, the Department has relied on herd certification to approve importations and minimize risk of importing more CWD. The Department has conducted 4 depopulations of game parks. The first was a game park stocked from a Colorado game park in which CWD was confirmed after elk from that game park were translocated to New Mexico. Two depopulations resulted when game parks wanted to cease operating the facility. To minimize risk to free-ranging cervids outside the high fence, the Department removed all cervids within one of the closing game parks. The game park was located in an area where CWD was not found and this park had not translocated elk for many years. Most, and maybe all, cervids were removed from this park before the fences were struck. If any deer or elk remained, they were considered to pose very low risk. The most recent depopulation was removal of cervids from a high-fenced paddock not licensed as a game park. Cervids were of unknown origin, and all were destroyed. A crematory was installed at Department headquarters. The crematory is sized for up to 1200 pound batches in cases of disease outbreak. Temperatures within the burn chamber are adequate to inactivate the CWD infective agent, according to published studies. This crematory is deployed to dispose all CWD high-risk cervid or other suspect material. The Department has conducted surveillance since CWD was detected in 2002. The distribution of CWD is determined from these data, and the long duration of surveillance gives high confidence to Department estimates of distribution. At present, CWD exists among deer and elk in the Organ Mountains, the Sacramento Mountains, and the Hueco Mountains. With continued spread of CWD across North America, New Mexico will increase surveillance efforts across the state in years to come. Tissue collection will be increased at border areas through hunter participation and through active surveillance. In particular, tissue collection efforts will be increased at the eastern border with Texas through collection stations with notice to hunters. Surveillance will be conducted at the northern border through increased contact with hunters and through active surveillance in herds at increased risk from southward movement of CWD from Colorado. Although CWD is not known to occur in Arizona, the Department will increase tissues collected from the western part of the state. This will be done through increased hunter contact and through active collection during Department capture operations. All personnel collecting tissues will be trained and meet competencies for collection. The Department cannot risk or pay for tests that are inconclusive because of technician error. Today, it is mandatory for hunters in GMU 19 and 28 to submit harvested animals for testing. This rule is casually enforced. In the future, enforcement in these two areas will be more active, and that can occur with very little additional effort. These hunts are limited in number, and access points are few making it straightforward to track licenses and hunters. If prevalence of CWD appears to be increasing more quickly, the Department could respond with more aggressive hunting in areas of high CWD prevalence or in areas of high deer or elk density. Harvest of males could be increased with some rule changes. Such management might make more sense under future conditions. No testing from mortality or hunter harvest is currently required in game parks. The Department could consider imposing mandatory testing in game parks to have some knowledge of CWD status within privately held cervids. Such regulations could be implemented within the framework of the federal Herd Certification Program. Additionally, some regulation and restriction could be imposed on intrastate translocation of privately owned cervids. Currently, only a notice of intent is required for game park owners to move cervids within the state. At the time of the first case of CWD, it was decided not to attempt to eliminate the infected herd of deer in GMU 19. CWD eradication through herd elimination is probably not possible now. Currently, no known vaccine or treatment is known to prevent infection, contagion, or spread of CWD. No treatment exists to cure or prolong survival of animals infected with CWD. CWD has spread from deer to elk to moose in North America. Despite clinical trials in primates and transgenic mice, most scientists still think it unlikely that CWD will readily transmit to humans. Evidence exists that the substrate can become infective in areas of high CWD prevalence. The hunting public in New Mexico continues to be largely unconcerned. However, if CWD becomes perceived to be a human health risk, that complacent sentiment could change. Hunter concern and fear could conceivably reduce participation in hunting and significantly impact New Mexico Game and Fish and other agencies in the United States that regulate and depend on hunting and license sales for revenue. Chronic wasting disease in deer and elk in southern New Mexico has prompted the Department of Game and Fish to expand areas where hunters must observe special rules pertaining to the handling and transportation of animal carcasses. Hunters can assist the Department in its chronic wasting disease research and tracking efforts by submitting deer or elk heads for testing within 48 hours of harvest at a tissue collection station or by arrangement with a local game warden. Hunters who harvest deer or elk can submit heads for testing at any Department office. Participating hunters will be entered into a special drawing for transferrable elk or oryx licenses.